The Wilson Blade Team 99 Lite Black/Green Entry Level Performance Tennis Racquet is perfect for that aspiring tournament tennis player looking for a technologically advanced stick (graphite frame) at an attractive price point. 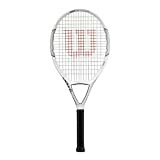 This best lightweight racket for spin and power has SET (Spin Effect Technology), otherwise known as an extremely open, spin-inducing string pattern at 16×18 (standard spin pattern is 16×19), and at 3 points head light, really whips through the zone. Everything about this racket screams SPIN! 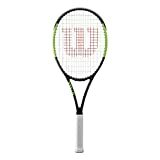 BEST LIGHTWEIGHT RACKET FOR SPIN AND POWER: The Wilson Blade Team 99 Lite Black/Green Entry Level Performance Tennis Racquet is a technologically advanced frame that comes at an entry level price point. It is lightweight at 10.4 ounces strung, 3 points head light, and with an extremely open string pattern of 16×18 (aka Wilson SET Technology), you cannot help but generate heavy, penetrating spin that will keep your opponent pinned to the baseline. RACKET TECHNOLOGIES: SET – Spin Effect Technology – simply put, is a seriously open string bed at 16 mains X 18 crosses. The extra space allowed by the open string bed allows each string to “bite” more of the ball, which helps to improve the revolutions per second when trying to impart heavy spin. Lower string tension helps to keep the ball on the strings for a fraction longer, which also helps to increase spin, as does utilizing a textured string designed specifically for spin. CHOICE OF FREE CUSTOM STRING COLORS: Because we want our customers to have the best purchasing experience possible, we have pre-strung these amazing player’s sticks with high-end, synthetic gut (16 gauge) – at mid-tension – for FREE! Who loves you?! We do!